There is no argument about whether competition sometimes affects community structure; nobody doubts that it interspecific competition may determine which, and how many, species can coexist competition is not always of overriding importance does. Equally, nobody claims that competition is of overriding importance in each and every case. In a community where the species are competing with one another on a day-to-day or minute-by-minute basis, and where the environment is homogeneous, it is indisputable that competition will have a powerful effect on community structure. Suppose instead, though, that other factors prevent competition from progressing to competitive exclusion, by depressing densities or periodically reversing competitive superiority. In this context, Hutchinson (1961) noted how phytoplankton communities generally exhibit high diversity despite limited opportunities for resource partitioning (his 'paradox of the plankton') and suggested that short-term fluctuations in conditions (e.g. 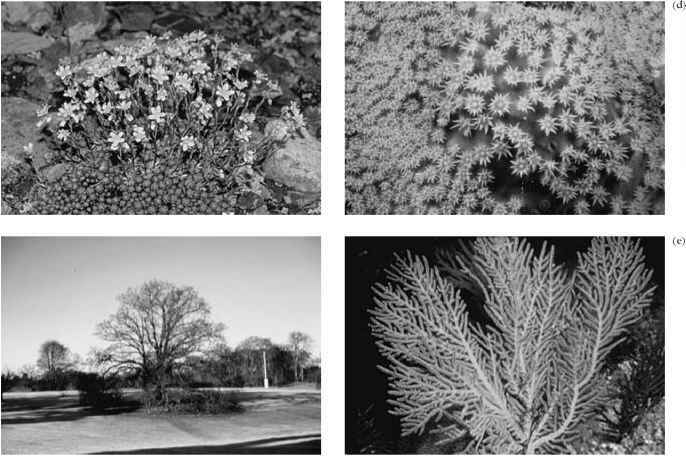 temperature) or resources (light or nutrients) might prevent competitive exclusion and permit high diversity. Floder et al. 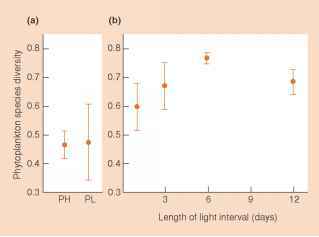 (2002) tested this hypothesis by comparing species diversity of inocula of natural phytoplankton communities in microcosms maintained at high (100 |lmol photons m-2 s-1) or low (20 |mol photons m-2 s-1) light levels with diversities achieved when light levels were periodically switched from high to low and back again every 1, 3, 6 or 12 days in a 49-day experiment. As predicted by Hutchinson, diversities were higher under fluctuating conditions, where interspecific competition was less likely to proceed to competitive exclusion (Figure 19.1). on interspecific competition were published in 1983. Schoener (1983) examined the results of all the experiments he could find - 164 studies in all - and noted that approximately equal numbers of studies had dealt with terrestrial plants, terrestrial animals and marine organisms, but that studies of freshwater organisms amounted to only about half the number in the other groups. Amongst the terrestrial studies, however, most were concerned with temperate regions and mainland populations and relatively few dealt with phytophagous (plant-eating) insects. Any conclusions were therefore bound to be subject to the limitations imposed by what ecologists had chosen to look at. Nevertheless, Schoener found that approximately 90% of the studies had demonstrated the existence of interspecific competition, and that the figures were 89, 91 and 94% for terrestrial, freshwater and marine organisms, respectively. Moreover, if he looked at single species or small groups of species (of which there were 390) rather than at whole studies which may have dealt with several groups of species, 76% showed effects of competition at least sometimes, and 57% showed effects in all the conditions under which they were examined. Once again, terrestrial, freshwater and marine organisms gave very similar figures. Connell's (1983) review was less extensive than Schoener's: 72 studies in six major journals, dealing with a total of 215 species and 527 different experiments. Interspecific competition was demonstrated in most of the studies, in more than half of the species, and in approximately 40% of the experiments. In contrast to Schoener, Connell found that interspecific competition was more prevalent in marine than in terrestrial organisms, and also that it was more prevalent in large than in small organisms. Taken together, Schoener's and Connell's reviews certainly seem to indicate that active, current interspecific competition is widespread. Its percentage occurrence amongst species is admittedly lower than its percentage occurrence amongst whole studies. However, this is to be expected, since, for example, if four species are arranged along a single niche dimension and all adjacent species competed with each other, this would still be only three out of six (or 50%) of all possible pairwise interactions. Connell also found, however, that in studies of just one pair of species, ... but are the data interspecific competition was almost biased? always apparent, whereas with more species the prevalence dropped markedly (from more than 90% to less than 50%). This can be explained to some extent by the argument outlined above, but it may also indicate biases in the particular pairs of species studied, and in the studies that are actually reported (or accepted by journal editors). It is highly likely that many pairs of species are chosen for study because they are 'interesting' (because competition between them is suspected) and if none is found this is simply not reported. Judging the prevalence of competition from such studies is rather like judging the prevalence of debauched clergymen from the 'gutter press'. Bias in the choice of studies is a real problem, only partially alleviated in investigations of larger groups of species when a number of 'negatives' can be conscientiously reported alongside one or a few 'positives'. Thus the results of surveys, such as those by Schoener and Connell, exaggerate, to an unknown extent, the frequency of competition. As previously noted, phytophagous insects were poorly represented in Schoener's data, but reviews of phytophagous insects have tended to suggest either that competition is relatively rare in the group overall (Strong et al., 1984) or at least in certain types of phytophagous insects, for example 'leaf-biters' (Denno et al., 1995). There are also examples of 'vacant niches' for phytophagous insects: feeding sites or feeding modes on a widespread plant that are utilized by insects in one part of the world, but not in another part of the world where the native insect fauna is different (Figure 19.2). This failure to saturate the niche space also argues against a powerful role for interspecific competition. On a more general level, it has been suggested that herbivores as a whole are seldom food-limited, and are therefore not likely to compete for common resources (Hairston et al., 1960; Slobodkin et al., 1967; see Section 20.2.5). The bases for this suggestion are the observations that green plants are normally abundant and largely intact, they are rarely devastated, and most herbivores are scarce most of the time. Schoener found the proportion of herbivores exhibiting interspecific competition to be significantly lower than the proportions of plants, carnivores or detritivores. Taken overall, therefore, current interspecific competition has been reported in studies on a wide range of organisms and in some groups its incidence may be particularly obvious, for example amongst sessile organisms in crowded situations. However, in other groups of organisms, interspecific competition may have little or no influence. It appears to be relatively rare among herbivores generally, and particularly rare amongst some types of phytophagous insect.